Update the look of your home with beautiful and elegant wood look tile in Sand City, CA. At Floor Store USA, we offer these tiles for homeowners who want to add the aesthetics of hardwood while retaining the low maintenance upkeep of tile. Unlike with natural hardwoods, you can install wood like tiles in moisture-rich rooms like your bathroom or kitchen. This makes them a great way to add the timeless look of wood throughout your home. No matter what design aesthetic you are trying to achieve, our store has the right solution for you. We offer our wood plank ceramic tiles in a variety of unique colors and patterns to create the basis for your brand new look. We can also find tiles that will match your existing décor so that you can maintain a uniform look throughout your home. When you are unsure of what design you are looking for, our team is here to help. Our flooring experts will work with you to determine the types of flooring best to install in your home and will also advise you on what surfaces will work best where. This way you will know that your new wood plank porcelain tile is the right fit for your home. If you are looking for a flooring solution that is strong, long-lasting, time-tested, and beautiful, then wood like tile is the right answer. Tile is incredibly resilient, providing a robust surface that will hold up to everything your busy household has to throw at it. Additionally, tile provides a very high level of moisture protection, and it will not warp or shift when in contact with water. This is why porcelain and ceramic wood tile provide a great way to add a wood aesthetic to your laundry room or basement. Tile is also very easy to maintain. This surface can be cleaned with a simple cloth or mop, and typically does not need any specialized cleaners or waxes to retain its beautiful look. 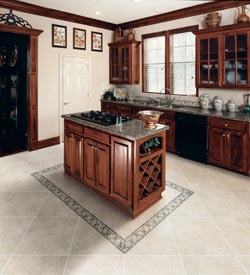 Tile is also cool to the touch, making it comfortable to walk on even during the hottest summer months. After choosing your new tile surface, it is best to let our team handle the installation. Our installers have the equipment and skills required to ensure your new ceramic or porcelain wood tile floor looks as fabulous in your home as it did in our showroom. Contact us when you are looking for flooring that adds the majestic look of wood and the unmatched resilience of tile. We proudly serve Sand City, CA and the surrounding areas.